Indian Institute of Science (IISc), Bangalore (rank 2), Jawaharlal Nehru University (rank 7), and Banaras Hindu University (rank 10) are the non-IIT institutions among the overall top 10 institutions. Seven of the top-10 spots in national rankings released by the HRD Ministry on Monday were occupied by the Indian Institutes of Technology (IITs), with IIT-Madras emerging on top. The six other IITs in the list are IIT-Delhi (ranked 3), IIT-Bombay (rank 4), IIT-Kharagpur (rank 5), IIT- Kanpur (rank 6), IIT-Roorkee (rank 8), and IIT-Guwahati (rank 9). The fourth edition of the National Institute Ranking Framework, or NIRF, launched by President Ram Nath Kovind, saw marginal changes in the top-10 institutions in overall ranking and engineering, management, college and university categories. Rankings were also announced for medicine, pharmacy, law and architecture. While IIT-Madras was announced as the best engineering college in the country, IIM-Bangalore was the top-ranked management institution. IISc topped the university category, Miranda House (Delhi University) the college category, and AIIMS-Delhi was adjudged as the best medical institution. NLSIU-Bengaluru was ranked the best law school in the country, and IIT-Kharagpur for architecture for the successive year. This year, 3,127 institutions participated in the ranking, down from 3,954 last year. Participation by government-run educational institutions has been mandatory since last year. In order to be ranked, all institutions are assessed on five parameters: teaching, learning and resources, research and professional practices, graduation outcomes, outreach and inclusivity, and perception. 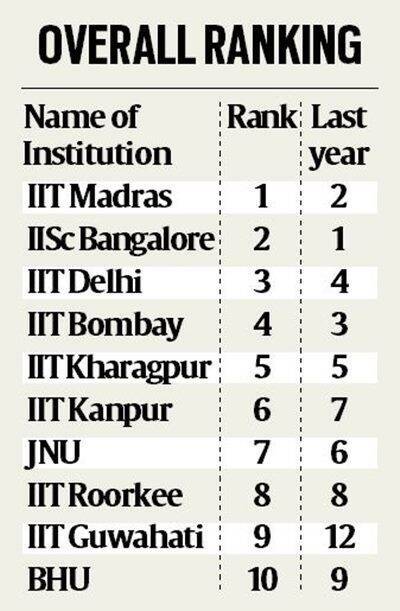 All institutions in the overall top-10 rank are more or less same as last year, except Anna University, Chennai, which broke into the club in 2018 and dropped out this time. It was replaced by IIT-Guwahati, which improved its performance by four spots from last year’s 12th rank. Among management colleges, top five ranks have been retained by IIMs, led by Bengaluru. IITs Delhi, Mumbai and Kharagpur are also among the top-10 in the category. Among colleges, Hindu College, Delhi, was ranked second, Presidency College-Madras third, St Stephen’s College was ranked fourth and Lady Shri Ram College (both Delhi University) fifth.